Ms. Brown led a fast-track life early on, but settled down after her marriage (the third of four) to fellow artist Gordon Cook in 1967. “Joan, Gordon, and Rufus [their dog] in Front of the S.F. Opera House,” painted two years later and the largest work on view, is, in her mature style, another quite impressive painting—dignified yet intimate, simple yet subtle. 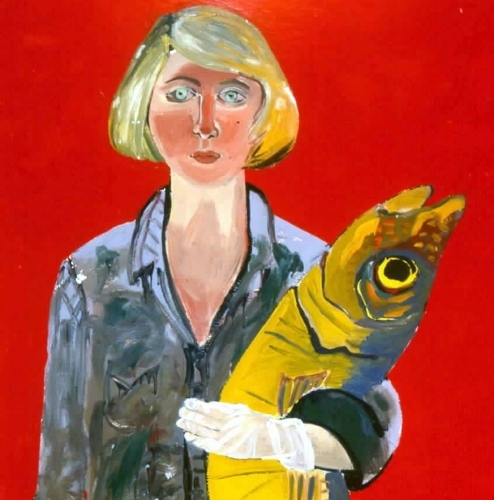 In it and such works as a self-portrait with her son, “Christmas Time 1970 (Joan & Noel)” (1970), she essentially tones down and cheers up Max Beckmann’s brooding hyperbole. Later, as presaged by “Woman Waiting in a Theatre Lobby” (1975), Ms. Brown would further simplify her human figures and backgrounds into semi-abstraction. While those paintings are certainly good, the ones in this show capture her high point.